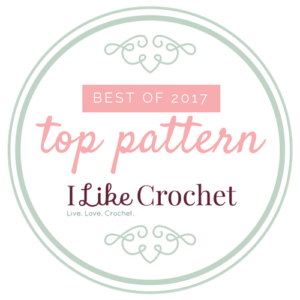 To find something in crochet that I have never seen before takes some doing, but I was fortunate enough to have one such product find me. 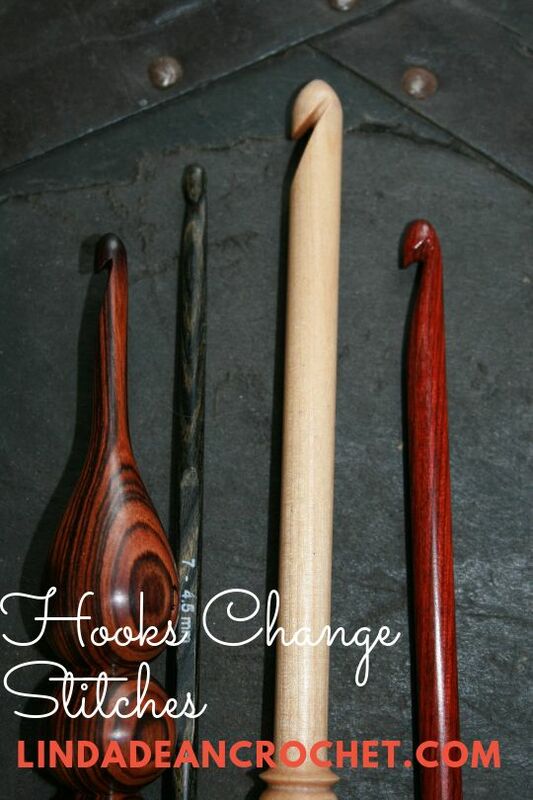 The Groove by Chetnanigans is a hand crafted tool designed to make the creation of broomstick lace quicker and easier. 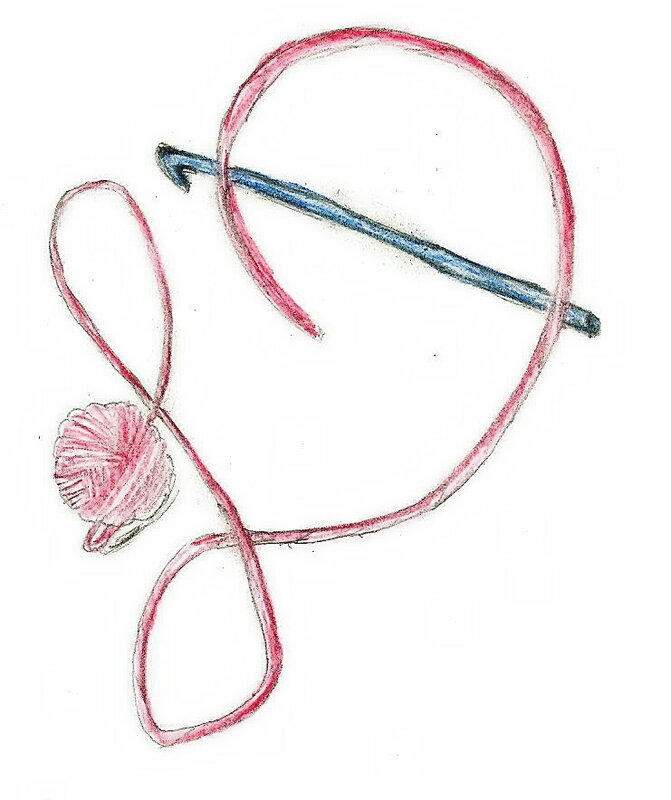 My understanding of its origins involves a woodworking husband fulfilling the dreams of his crocheting wife. 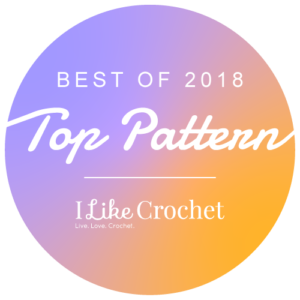 This couple has created many creative products to fulfill the needs of crocheters including, but not limited to; hook and notion organizers, blocking boards, and hair pin lace looms. But the groove is something unlike anything else I have seen. 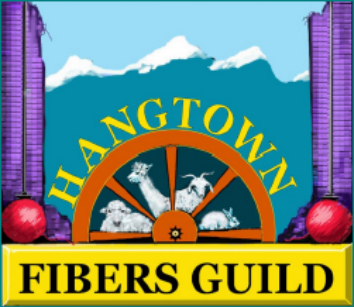 Sean and Holly of Chetnanigans reached out to me earlier this summer, after noticing that I was teaching a Broomstick Lace Technique class at the CGOA national Chainlink conference. They asked if I would give the Groove a try and give them some feedback. Well I found it unique enough to even share it with my students, many of which ordered their own. 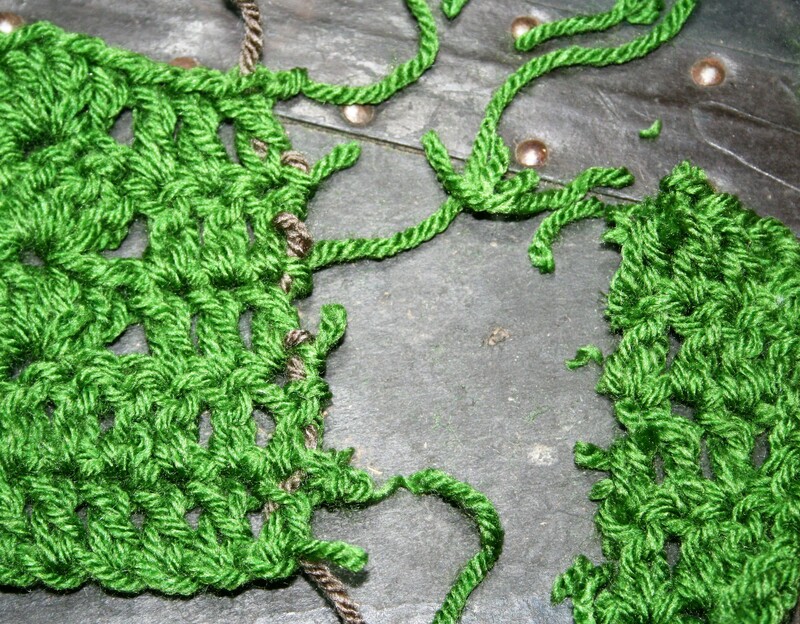 Traditional broomstick lace has been done with a knitting needles. 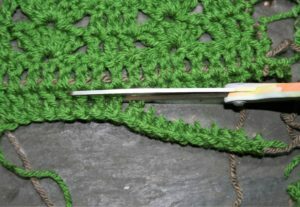 By working loops over a knitting needle and then working the loops back off to create a stitch that sometimes is noted as resembling the eye of a peacock tail. One of the biggest drawbacks to this techniques is that it is a bit awkward…it feels like you need a third hand to hold everything. The Groove addresses this issue by putting a base on the “needle” so that it can actually stand upright on a table, so simple it becomes a “why didn’t I think of that?” kind of thing. However the Groove doesn’t just stop there, it then has…well…a groove at its tip. It is this groove that sets the Groove apart. 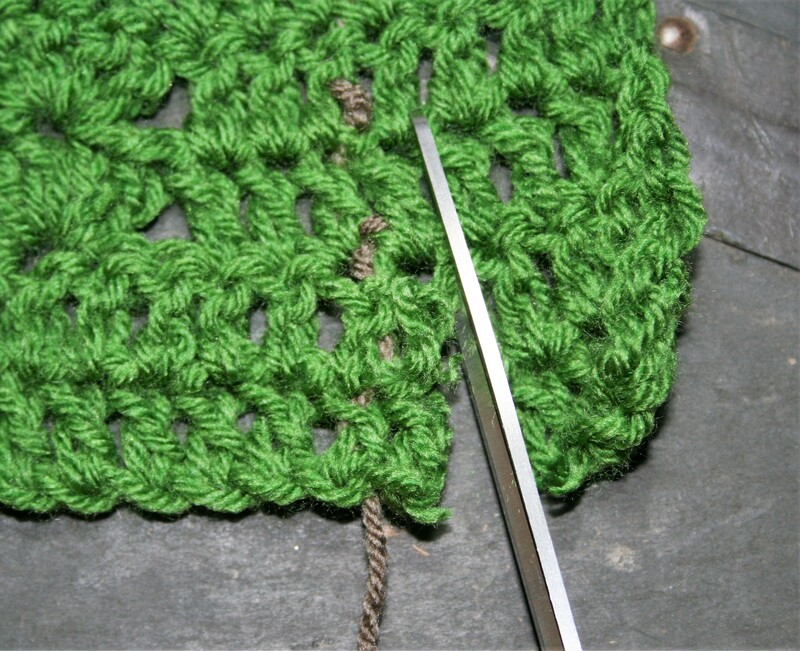 A crochet hook slips into this slit and under the loops that have been added to ease the removal and really make the process faster. 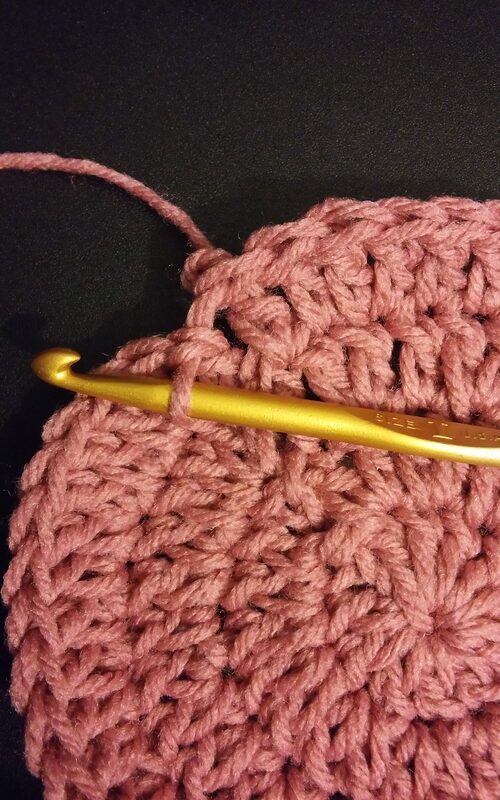 When using a traditional knitting needle you move these loops to the tip and work your crochet hook between the loops and needle, it is not particularly difficult, but it is a slow process when compared to using the Groove. 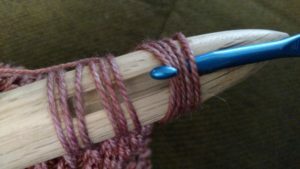 The Groove is equivalent of a 25mm knitting needle, or in other terms has a 1” diameter shaft, so it is a perfect size for light to medium weight yarns. 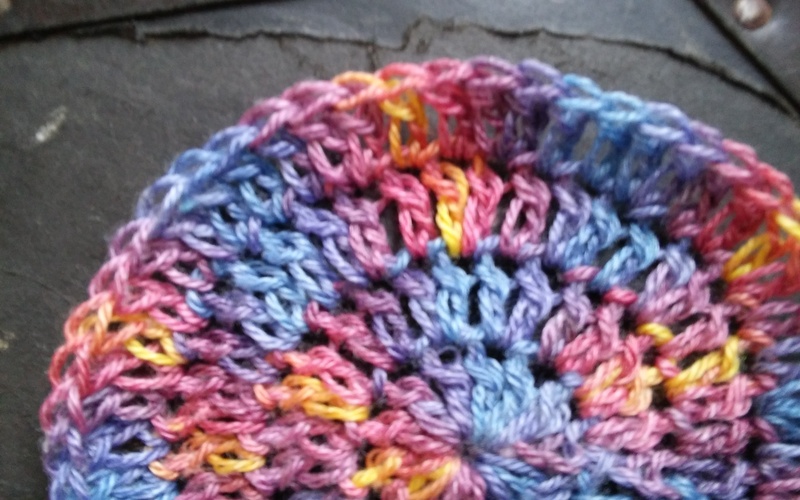 It has a nice weight, not feeling to light or flimsy or to heavy and clumsy. The only drawback I have found is that my kids think it would be a great spike to kill vampires or even club someone, so I have to keep an eye on its location to ensure that it is only used for its intended purpose. But if I find some vampires I guess I am prepared, and in the mean time I will have a great time crocheting up some broomstick lace. 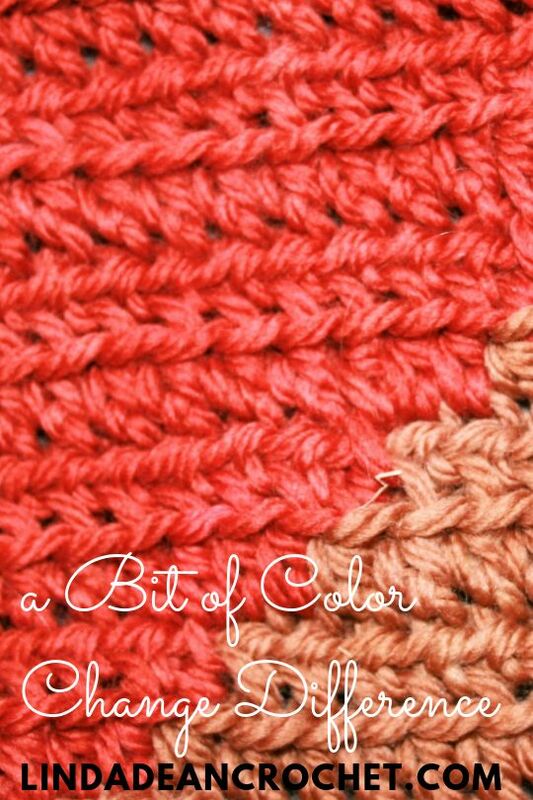 Often it is just a subtle texture that can give a great effect on a fabric. 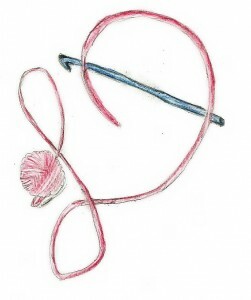 This little stitch, which I refer to as a berry stitch, is quite effective in this regards. 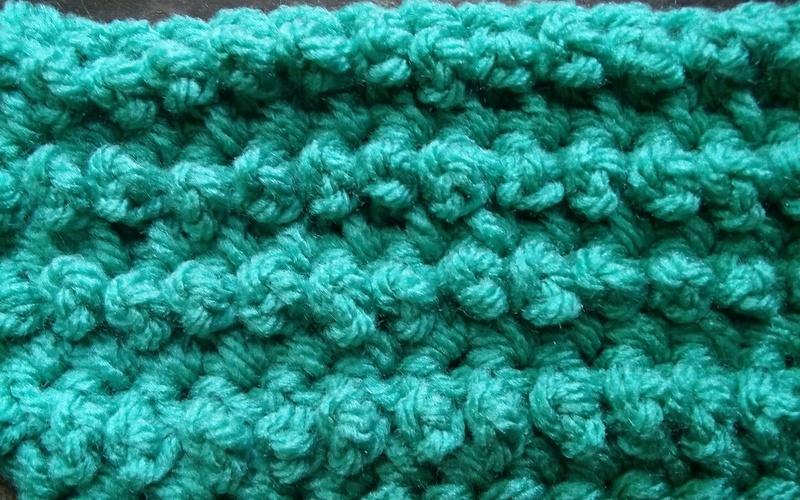 This stitch is essentially a single crochet and a chain 3 loop. 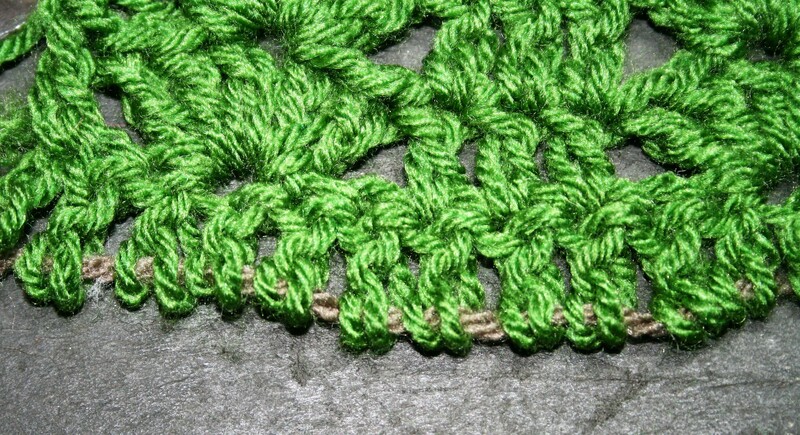 The chain 3 loop is worked between the stitches, then pushed to one side of the fabric. 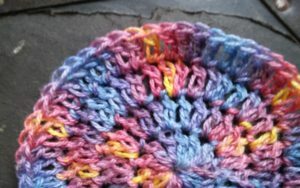 This enables the fabric to have a little more stretch, and a very gentle little “bump” of texture. 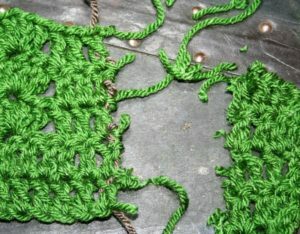 The chain loops can also be worked between larger stitches, however the loose a bit of their “bump” effect as it basically squeezes the loop in the space between the tall stitches. 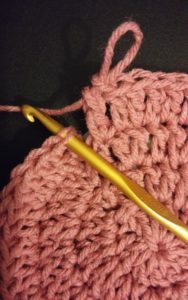 The single crochet is a shorter stitch so the chain loop is pushed outward. 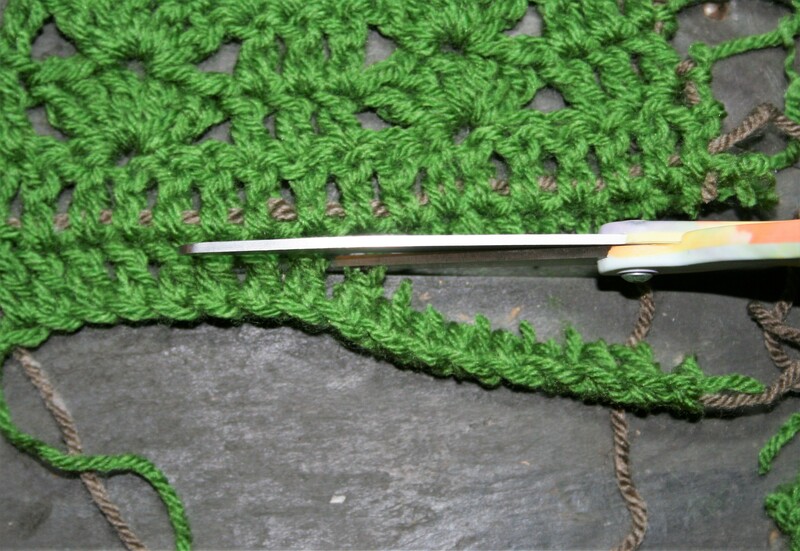 This chain loop can be worked between every stitch, as I did in my sample, it can be worked every few stitches. 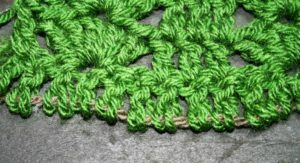 Working every stitch creates a row that reminds me of little pearls, but this stitch can be worked so that it would be a staggered bead of these little pearls instead of a row. 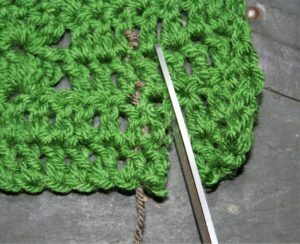 These loops are typically worked in one row and the next row is worked without the loops. 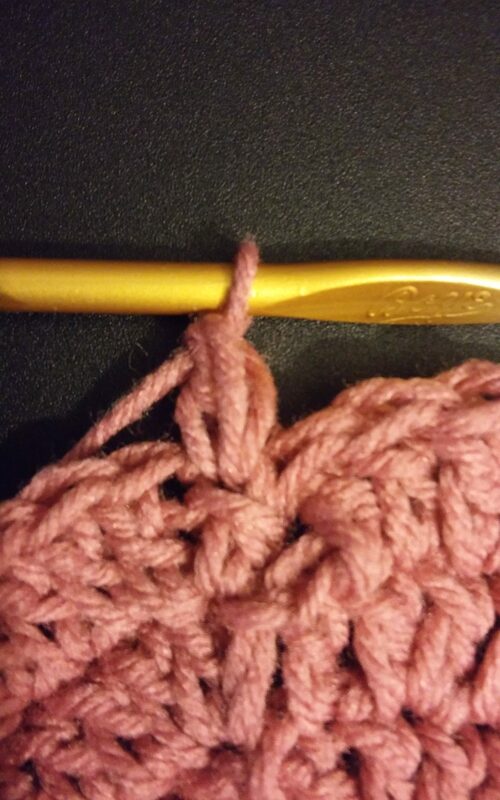 This results in a fabric that only has bumps on one side. There is nothing that forbids working this stitch on every row, I just find that in my purposes I prefer it only on one side. 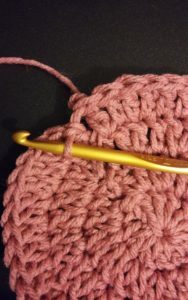 I have used this stitch several times, often I use it in floor mats or the soles of slippers. 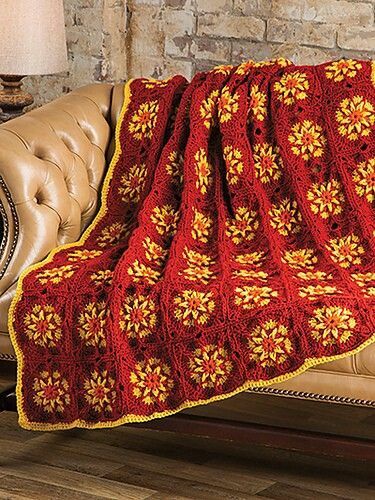 I also find that I really like it in baby blankets. One of the things that I find nice with this stitch is that for slippers and mats, is that the extra stretch in the stitch gives it a very soft, fluffy, almost pillow like quality. That then is not only attractive to look at, but it is also very functional.